LeeAnne Domangue hails from the City of Brotherly Love. Raised in Philadelphia, she received a degree in Accounting and moved to Houston at age 23. Early on LeeAnne developed a love for creative writing and poetry, but was focused on her career in Accounting for 15 years. She then began dabbling in painting and soon that passion took over. LeeAnne is a self-trained artist and sold her first piece in 2005. Color is the key to the movement and feel of her work, which is mostly contemporary, both abstract and figurative. 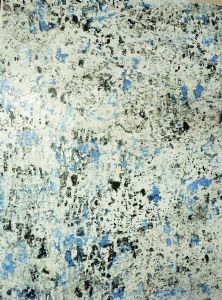 Recognized for her use of texture, LeeAnne uses oil and acrylic on canvas or wood panel, with matte or glossy finishes. Experimenting with different application tools and resin coating, she takes a nontraditional approach to art, resulting in an updated and eclectic look suitable for residential and commercial applications. She incorporates her love of words into the naming of her artwork. LeeAnne's work is currently on display at the Betz Gallery in Houston. Her paintings are also featured in home staging of the Jane Page Design Group, a major design firm, who also recommends and sells LeeAnne's pieces to their clients. She has done commissioned work, including a painting for Maura Pauro, Houston art world consultant with the Laura Rathe Gallery. For the past few years, LeeAnne's paintings have been showcased in restaurants in the Houston and Woodlands area. Custom modern, contemporary, and abstract paintings by Houston based artist, LeeAnne Domangue. Textured paintings using oil and acrylic on canvas or wood panels, with matte or glossy finishes.